Please review this Frequently Asked Questions (FAQ) section for answers to questions or clarifications you may need about using Home-Cost software. If you cannot find the information you require, please reach out to us by using our Contact Form and we will respond back to you. 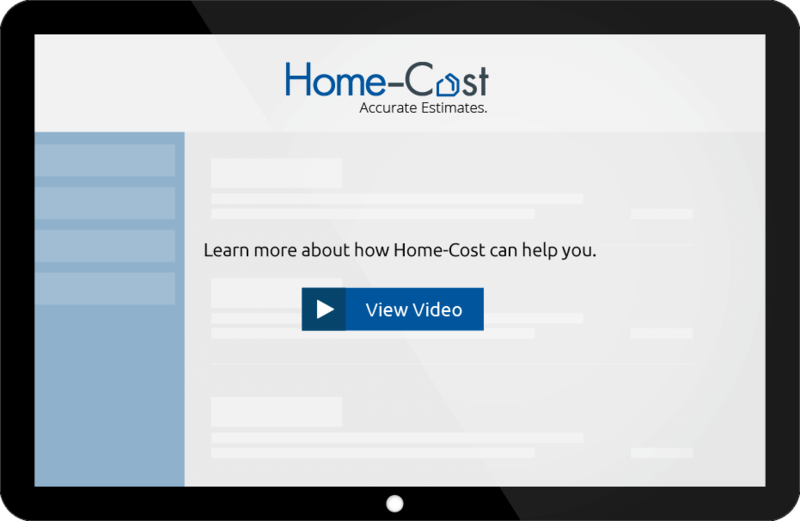 Home-Cost provides a patented home construction cost estimating application used over the Internet from any computer. Home-Cost software is technically a SaaS or “Software as a Service” application sold on a non-exclusive licensed use basis. Home-Cost software is unique to the design and construction industry because of its ability to model the cost of virtually any home design, in real time, with or without the use of house plans and at any stage of design. The value of Home-Cost is its patented residential estimating technology allowing construction cost calculations to occur as design changes are made, in real time over the internet. As a user makes choices determining home design and material selections, Home-Cost provides instant cost feedback. Thousands of possible design options coupled with real time cost feedback allow valuable and effective “What-If?” cost exploration of design changes. How do I explore partnership opportunities with Home-Cost? Home-Cost Partners are more of a strategic relationship with mutual marketing objectives, featured placement and promotion on our respective websites and the goal of enhancing the customer experience of our respective websites. Partners may or may not even result in an actual sales referral compensation structure to you or to us but will always result in a co-marketing synergy that benefits each others customers and our mutual websites. If you are interested in becoming a Partner then please let us hear from you by using our Affiliate & Partner Contact Form. How is Home-Cost accurate enough for a limited money back guarantee? Use of Construction Assemblies and parametric estimating methods so nothing is accidentally left out as is common with traditional take-off estimating methods. How does Home-Cost have costs for my location? Home-Cost has a cost database for the continental US, Alaska, Hawaii and Canada. Local costs are determined by using a 5-digit zip code which provides over 40,000 unique locations and targeted regional accuracy. Does Home-Cost include site development costs for my project? Yes! Home-Cost includes costs for site development scope such as site clearing, roads, walkways, driveways, patios, decks, septic and well, landscaping, power and utilities, and more. Does Home-Cost include appliances needed for the project? Yes, all appliances needed in your home are available in Home-Cost including options for stoves, ovens, cook-tops, exhaust hoods, dishwashers, refrigerators, freezers, microwaves, trash compactors, wine coolers, washer and dryers, warming ovens and more. Does Home-Cost include costs for sales tax? Yes, sales tax is included and is determined by your project zip code. How does the limited money back guarantee work? Home-Cost.com provides a 90 day limited money back guarantee that Home-Cost’s calculated construction value will be in a cost range established by 3 licensed contractor bids. We require you get contractor bids of the same house design, scope and quality level of materials and contractor markup used in the design you estimated with Home-Cost. Why doesn't my contractor's quote match Home-Cost? If you give the exact same plans and specs to 3 different builders you will get back 3 different prices. That’s why we require multiple bids and guarantee Home-Cost’s calculated construction to be in a cost range established by 3 licensed contractor bids. If you have a budget problem, remember that it is common for a client to have selected different scope of work or material quality than what their builder assumed in the quote. This is often the reason why a contractor’s quote is not consistent with a client’s design selections. Evaluate your contractor’s bid detail for adequacy of all allowances and the possibility of different scope or assumptions inconsistent with the choices you made in your Home-Cost estimate. Is my project data saved? Your INSTANT or FULL FUNCTION project data will be saved for the duration of your use period, and then it is deleted. Home-Cost PRO project data will be saved until the project is cancelled, after which the data is deleted. Can I reactivate project data after my subscription expires? If you have a Home-Cost Full Function account, then your project data is unavailable once your subscription is expired. Home-Cost provides you the ability to print out your design and material selections and cost report at any time during your subscription. You cannot add more time before your subscription expires. Does Home-Cost retain my credit card information? No, Home-Cost does not retain any personal credit card information. Your personal information is secure. Is there a Control Panel for my project account? What does the "Clear Session" button do? Clicking the “Clear Session” button allows PRO users to completely start over. At some point you may wish to cancel out all of the selections you have made in your project estimate so that you can start another estimate fresh. We highly recommend you print out your existing cost report before you clear all data. To clear your project of all previous selections check the “Clear Session” box for your project account and then confirm. When you open the project account your session data will have been deleted. Use this feature with care. Is there a Control Panel to manage my Home-Cost PRO project accounts? Yes, the Control Panel for Home-Cost PRO is very comprehensive. It allows you to manage multiple accounts at two levels: the Control Panel and the Project Information Panel. The 3-tab Project Information Panel allows management of project information for each project. It allows you to name a project, track client contact information, design and construction team contact information along with design and budget notes. Also see the FAQ section below called “Using Home-Cost PRO” for more information. What options exist for Home-Cost subscription length? Home-Cost INSTANT and FULL FUNCTION are provided with a 6 month use period. Home-Cost PRO project accounts are monthly subscriptions which automatically renew each month until the project is cancelled by you. Each project is renewed by charging your credit card $24.50 per project, per month. To purchase these PRO project accounts, a $99 one time set up fee must first be purchased. Can I extend my project subscription time period? “Yes” with Home-Cost PRO. You control the length of your subscription period. Home-Cost PRO projects automatically renew each month, which you can cancel at any time. “No” with Home-Cost INSTANT and FULL FUNCTION. The plan comes with a fixed 60 day period of use / account access period. Does the Home-Cost PRO Set Up Fee get billed annually? No, the Home-Cost PRO Set Up Fee is a $99 one time only cost and allows you to purchase individual project accounts thereafter. One of my monthly PRO project accounts just renewed, can I cancel the project? Yes, you may cancel Home-Cost PRO project accounts at any time. To access this function click the “Cancel Project” icon in your Control Panel for the project you wish to cancel. If you decide to cancel your project access to that project will terminate upon cancellation. Please use the Automatic Renewal Date shown in the Control Panel for reference and cancel BEFORE that date. You will no longer be billed on a recurring monthly basis for the project once you cancel. No refunds are provided for partial month usage. Upon cancellation all your project related data will be deleted from our servers and is no longer available. Please make sure you have made hard copy of all information before cancelling. Will Home-Cost estimate a renovation or addition? Home-Cost is only designed to accurately estimate a freestanding single family residence. However, there are some “workaround” techniques that can be used to estimate the cost of an addition in some design situations. Please Contact Us for more information. What limitations exist on home design and type of home construction? Home-Cost will estimate almost any style of single family detached home up to two stories plus a lower level and garage, attached or detached given the limitations described below. Over 4,000 options are available for your home design resulting in virtually unlimited design and material possibilities. For example, you can select from over 15 countertop options including granite, quartz, tile, concrete and more; over 30 flooring options including carpet, cork, tile, stone, wood, vinyl, linoleum and more. Exterior options include over 30 siding options such as vinyl, aluminum, wood, cement fiber, log siding, stucco, stone, imitation stone, etc. Roofing options including asphalt, wood, tile, slate, metal, concrete, rubber, flat and so on. Green design construction options are also available. Home-Cost provides structural system choices including ICF (Insulated Concrete Form), SIP (Structural Insulated Panels) in addition to stick-built wood framing or concrete block construction. You also have the option of Timber Frame construction. What if I don’t understand a question or terminology? Home-Cost has “Help” links at major questions to assist you in understanding a question or construction term. If you still have a question or need any help in using Home-Cost just use our Contact Us form for more help. Can I stop part way through Home-Cost and come back later? Yes, just complete whatever page you are on and click the “Next Step (Save and Continue)” button at the bottom of the page. Your selections are saved until you come back later. If you leave a page without clicking the “Next Step (Save and Continue)” button at the bottom of the page, your selections for that page will not be retained. Why doesn’t Home-Cost use “Cost per Square Foot” for cost estimating? “Cost per SF” for cost estimating is fundamentally unreliable and can be an estimating trap since it only applies the “Cost per Square Foot” against Finished SF and not the entire Constructed SF of the home. “Cost per SF” estimates also do not consider varying quality levels within an individual home design and often omit costs for site work, excavation and appliances. Construction cost however is determined by the Constructed SF of a home and the quality level of materials and finishes, not just Finished SF. Although “Cost per SF” budgeting may seem quick and easy, it is unfortunately also incorrect. What’s the difference between “Constructed” SF and “Finished” SF? Finished SF only includes livable areas such as bedrooms, kitchen, great rooms, etc. Constructed Square Feet includes all areas that are being constructed whether livable or not such as an unfinished basement or crawl space, garage, bonus rooms, enclosed porches, etc. What is a construction “Assembly” as used by Home-Cost? An “Assembly” is a grouping of components that are included in the cost of an item. For example, cost for a “sink assembly” in Home-Cost includes the sink, faucet, waste and vent line, hot and cold water lines, labor and sales tax. A “window assembly” includes the window unit, finished casing and trim, labor and sales tax. An “exterior wall framing assembly” is priced at a cost per square foot of wall area and includes costs for the wall framing, insulation, sheathing and vapor barrier, labor and sales tax. Why does Home-Cost use an Assembly approach to estimating? Unlike take-off estimation, “Assembly” based estimating can be used at a conceptual level for early stage costing or at a detailed design level for final blueprint stage estimates. Assemblies carry costs for their components and the unit of measure that makes sense for that assembly. For example, wall framing is measured in “wall square feet” not board feet of lumber. As quantity of an assembly goes up or down, costs for all the corresponding components are always included and cannot be accidentally forgotten or omitted as with take-off estimates. I ran through Home-Cost and I can’t afford the house! Now what?! Home-Cost however you now have the power to evaluate your design decisions and vary the quality level and scope of your home’s design to meet a realistic budget. You may have selected expensive construction materials or finishes. Go back and reconsider all your construction material quality levels. Make sure you have selected the most economical construction selections and quality levels except where you absolutely needed the increased quality. If you still are over budget, your home design may be too large and the scope of construction needs to be reduced. Look at ways to reduce the home size and amount of finished square feet and constructed square feet. If you have gone back and reduced the quality of materials in all acceptable areas and reduced the home size and are still over budget, you may have had an unrealistic budget in mind to start with. Home-Cost will allow you to model and simulate the costs of various designs and materials of construction until you are in budget. It is easier to fix a budget problem on paper than while a home is being built. One last option exists, although we do not recommend it unless you have the experience and time, is to be an Owner-Builder. This is where the Owner does not hire a General Contractor but rather directly hires the multiple subcontractors and manages their scheduling and work. This can save between 10% to 20% of your home’s construction cost if managed well, but you will add at least that much to your costs if handled incompetently. If you choose the route of an Owner / Builder, be careful and do the research needed to fully understand your responsibilities. Can Home-Cost help if I'm already over-budget? Yes it can. All projects have three interrelated variables that must be balanced. They are Quality, Cost and Size. You can pick any two and the third is determined by your selections. For example if you know your budget (cost) and you know how big your house is (size) that will drive the quality levels of what you can afford. Home-Cost allows you to vary your home’s Quality levels and Scope (or size) until your budget is in balance. In an over-budget situation improper Quality and/or Size decisions have created an out of balance condition with Cost. The solution in an over-budget circumstance is determining how to vary the Quality or Size variables to meet a predetermined Cost. The power of Home-Cost™ is that you will be able to model and change any of these variables to see the impact on the other two, until you get things in balance. Home-Cost process puts you in control of modeling “what-if?” options to building materials, design characteristics and home size, until you are satisfied and within budget. What’s the purpose of the Set Up Fee and Project Accounts? The Set Up Fee allows you to buy unlimited PRO project accounts on a recurring billing basis for $24.50 per month per project (about 50% off retail). To use Home-Cost PRO you must first pay a one time Set Up Fee at a cost of $99.00. How do I manage and track multiple project accounts? Home-Cost PRO allows you to manage multiple accounts at two levels: the Control Panel and the Project Information Panel. Project Information Panel: At a detailed level each project account has a link to its own Project Information Panel. The Project Information Panel has multiple screens and allows you to track all kinds of sales, customer, construction and design information related to a specific project. What specific information can be tracked with the Project Information Panel in Home-Cost PRO? You may edit and save information unique to your project including Project and Contact information, House Plan information, Contact Notes and personal contact information for the design and construction team including notes, websites house plan information budget information and much more. How do I access the Project Information Panel? By clicking on the “Edit Info” link on any project in the Control Panel. That launches the Project Information Panel for the project. Can I have a different Project Information Panel for each project account? Yes, each project has its own unique Project Information Panel. Home-Cost provides very detailed cost reports but they are based on construction “assemblies” and not organized in an obsolete quantity take-off format. Quantities used for measurement in take-off estimating are often somewhat obscure such as “board feet” of lumber or “cubic yards” of concrete. Home-Cost’s patented estimating engine develops costs using construction “assemblies.” Assemblies carry costs for their components and the unit of measure that makes sense for that assembly. For example, wall framing is measured in “wall square feet” not board feet of lumber. As quantity of an assembly goes up or down, costs for all the corresponding components are always included and cannot be accidentally forgotten or omitted as with take-off estimates. Why does Home-Cost use construction “Assemblies” instead of take-off unit quantities? Take-off quantity estimating can only be done after a design is completed and is labor intensive and prone to errors due to missed items and incorrect quality level assumptions. Take-off quantity estimating also cannot provide instant cost feedback to a design change or reflect a qualitative change. With take-off estimating, any design change made requires that the computer drawing be revised or manually updated to reflect the change before take-off quantities can again be recalculated. These problems are all avoided by Home-Cost and the use of assembly based estimating. Why are there 3 levels of cost reporting available in Home-Cost? Home-Cost provides different levels of cost reporting depending on the detail needed and on the product purchased (e.g., Full Function or PRO). Cost estimate reporting comes in three levels of breakdown with Level 1 being the most summarized and Level 3 the most detailed. Level 1, Level 2 and Level 3 cost reports are provided with Home-Cost Full Function and Home-Cost PRO. Can I export or print my cost reports? You may print your cost reports out to a printer or as a PDF with any Home-Cost product. You may export the cost report to an Excel table format (no formulas) with Home-Cost Full Function or Home-Cost PRO. Home-Cost is not accepting Affiliate sites at this time. Home-Cost welcomes partnering and strategic marketing. Partners are viewed as more of a strategic relationship with mutual marketing objectives, possible featured placement and promotion on our respective websites and the goal of enhancing the customer experience of our respective websites. If you are interested in becoming a Partner then please let us hear from you by using our Contact Us Form.